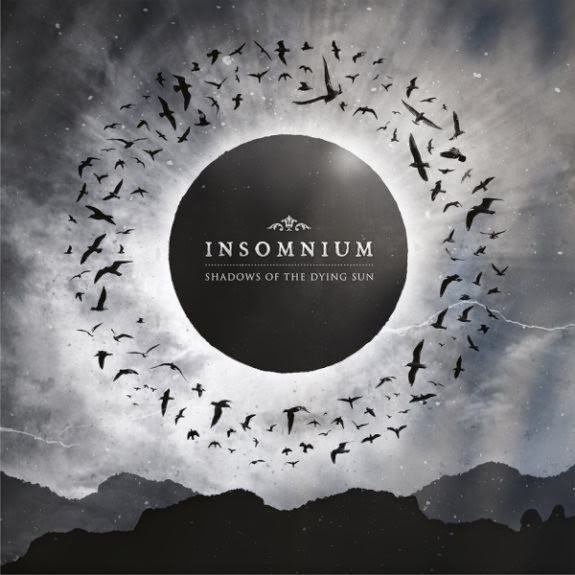 I've been experiencing an ever-increasing level of Insomnium fatigue for years now, because it seems like they just seem content to keep remaking the same album. Shadows of the Dying Sun is more or less Across the Dark Part III, with a number of melodic analogs of songs they've already written, and thus I found it a little difficult not to compare individual tracks here to my favorites of the past like "Down With the Sun". And when that happens, this disc always loses, so you can tell I'm a fraction let down that they seem to have ceased the evolution over their first four outings, hit a stride and then never changed up the pace. Perhaps that's not fair, since the EP previous to this had a real folksy/prog balance, but I was not feeling that one much either. On a technical level, Shadows is superb, with some of the richest and cleanest production this niche has ever offered. Melodies/harmonies gleam with an emotional radiance, while layers of subtler rhythm guitars and atmospheric but restrained keyboards create a lush background, almost like clouds constantly bursting, only they're the same recycled tears of heaven alighting upon our shoulders and faces. When the clean guitars in tunes like "Revelation" erupt into the heavier parts, you definitely get a whiff of that old In Flames/Dark Tranquillity magic when it was fresh in the 90s, but so many of the melodic progressions in this and other tunes feel almost precisely like particular tunes off the two albums before this one. The heavy vocals continue to channel the resilient, fulfilling growls of Taneli Jarva (Amok-era Sentenced), which is one of the reasons I so enjoyed this band to begin with, since they brought me nostalgia for that under-appreciated work, and there are some cleans in addition; but the distribution of acoustics and melodies seems problematic in its predictability. I've seen some comments that Insomnium are almost like a 'pop' version of melodic Finnish death, lacking some of the wildness of their peers Children of Bodom, but that tag might have be better applied to Omnium Gatherum, who have a more cubicle sensibility which connects them to the modern world. Come to think of it, there are a lot of -m sounds in these bands' names...mmmmmm, cookies! At any rate, Shadows of the Dying Sun continues this band's solemn commune with the natural world, if it was translated through an impressive studio which flawless 21st century sound. I have no issue with the musicianship or the intentions these guys bring to the table, but as they have already written the same album (in superior quality), I wish they'd throw a few unexpected curve balls into how they compose the guitars. I don't see diehard followers of the group having much of a problem with this, but as One for Sorrow felt like a (very listenable) step down from Across the Dark, this too feels like diminished returns. I feel the same about this as I do when staring at a well cut gemstone...brilliant for a few minutes in how it captures the light this way or that, or summons up a memory of beauty, but ultimately just a superficial stone.